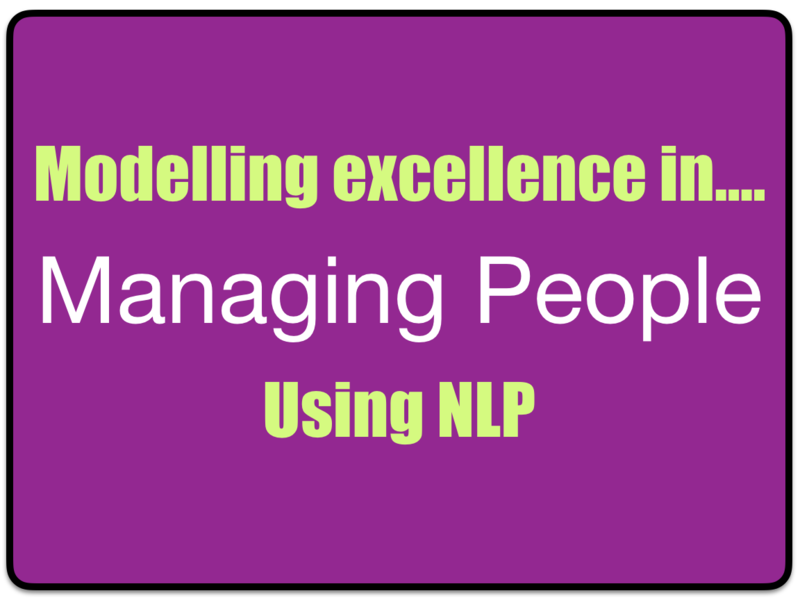 At Master Practitioner level and in our course students learn how to apply their new NLP techniques in carrying out a modelling project and developing excellence in their chosen skill. We ask students to pick a skill that they would like to have and to model someone in order to gain the skill. There are plenty of exercises in this video to assist you in discovering what you would like more of in life and what you would like less of. This is with a view to you choosing a skill or habit to model for the future. We hope that the video provides you with some amazing value and helps you to develop some plans for creating your own excellence on your road ahead. Below is a transcript for the video. The exercise questions are in bold for you. If you have any questions or comments on the video then please go ahead and leave a comment below. In this webinar we are going to look at one of the most valuable outcomes that you can get from learning NLP. Modelling excellence. What do you want to become? How do you want to spend your days? How good do you want to become at what you do? What skills would you like to have that you don’t already posses? With enough time and dedication you really can have what you want from life. 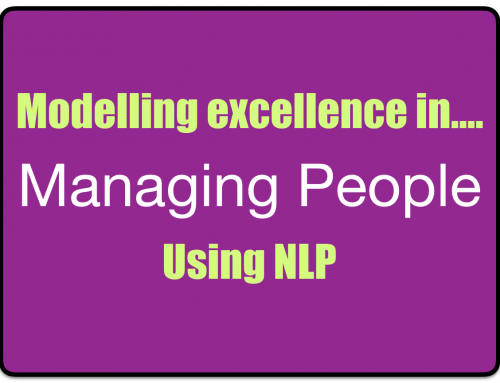 In this video I’m going to talk you through how you can get what you want and develop excellence using NLP modelling. The beauty of the NLP structure is that once you understand how this works then not only can you do this yourself, but you can also work with others so that they can do it too. This is one of the reasons why NLP is fantastic for coaches. Students on our NLP courses learn all the skills and thought processes that they need in order to acquire excellence and develop this with others, whatever the field. Now you may already know what you want to become excellent at. You may have goals and objectives for your life written down and watching this may be a step towards achieving them. Pause the video if you need to and write these things down. Now that you know what you know. How does this change things? What ideas do you get about what you want to do? Looking into the future what is it that you want to achieve? If you haven’t got a list then write one out. Now that you have your list we can split it into two columns. Column 1 is the things on the list that you don’t want and you have or do now. 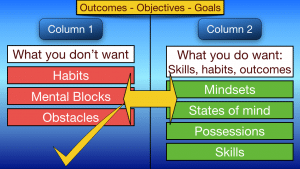 Column 2 is what do you do want, skills that you want, habits that you want, outcomes that you want. Write out two columns on a fresh piece of paper and create two lists. By doing this you have translated thoughts into language. The N of NLP, neuro or thoughts, to L in NLP, linguistics. Column 1 is a list of things that you don’t want and they may include habits that you don’t want as well as possibly situations in life, mental blocks or obstacles. You have written them down, so they are identified as being important to you. Some of them are possibly repeating patterns (this is the P in NLP, programming) of behaviour, maybe involving other people. If you look at this list and think now of other things that should be on it then add them. Column 2 is a list of things that you do want. These may include mindsets, states of mind, possessions, skills. Are there any other things that you would like to add to this list? Think about the things in column 2 now. How come you don’t have them already? You may notice as you contemplate this that the reason that you don’t have some of them relates to some of the things that you have written down on column 1. Does it? It may do. If we ignore the things that are holding us back then it is tricky to move forward. We must address our problems, our mental blocks and then with them removed we can focus on getting what we want. Just noticing this, if you have may help you change. That is how easy change can take place. If it hasn’t changed anything then it might just have created a shift in thinking. This can be the precursor to change. Anyway the BIG point of this is that NLP provides you with techniques and processes that you can use to solve the problems in column 1 and create the future that you want in column 2. In this video we are going to concentrate on column 2. Our NLP training courses take a two stage process. Remove any problems, create results. In this webinar we are going to assume that your problems are solved at stage 1 and we are going to focus on getting the things that you do want, stage 2, skills that you want and mindsets that you want, actually these two things often go together, don’t they? Mindsets and skills. You can achieve whatever you put your mind to. The oldest person to climb everest was over 80 years old, run a marathon – over 90, get to the north & south pole – over 80 , youngest person to build a business and make a million – certainly less than 14 years of age. One man who definitely thought that he could was Laszlo Polgar. Laszlo was an educational psychologist who believed that we are all born to genius and excellence can be achieved by anyone. He was determined to prove this was true. He went to extreme lengths. He advertised for a wife to bear him a child to prove his theory via a lifetime experiment. Laszlo found someone who was willing to go along with his plan and they went on to have three girls together, the first being Susan. They decided to turn Susan into a world-class chess player. Laszlo was a chess hobbyist and had no particular skill as a chess player at the time. He learned the techniques himself via hundreds of books that he read and he taught his daughter Susan all that he knew. They devoted many hours per week to chess, having fun as they practiced together. The practice paid off and Laszlo realised his dream for Susan. At age 17 she became the first woman ever to qualify for the men’s world championships and at 21 she became the first woman ever to become a chess grand master. He also went on to teach his other two daughters to play chess, both of them going on to reach elite standards in the game. Beliefs are a very powerful thing indeed. What are the key things that they are doing or thinking that the others do not do or think? We have to ask them. You can take the trial and error based approach or you can find someone with the mindsets and skill that you want, find out how they do it and copy them. This is what top organisations do, sports teams, anyone at the top of the game does. EG Sky Cycling, Formula 1 – covering part of the car, Americas cup, the tablet and smartphone war, Apple, Samsung etc. I’m not saying blatantly copy trademarked, patented and copyrighted material but find out how they do it and do it better and in your own way. Successful people will often be only too pleased to talk about themselves and their success. In fact often they learn as much about themselves as the person does who is modelling them. They find out ways to get even better, discover things that are limiting them and holding them back from progressing further. We see top sports people on TV or live and we watch them and we imagine being able to do what they do. Do we think that we can or can’t do it? If we think that we can’t then we definitely can’t. “Can’t” spells out a limiting belief, a mental block. We can copy their actions and we might get somewhere near doing what they do. What we don;t know however is what is going on inside their head. This is the second part of the story and without that knowledge we will only be able to create a poor replica. We need to the full story, so we need to ask them about their thoughts. We must model their behaviour and their thinking. There are two sides to modelling. Behaviour and thoughts. Thought accompanies behaviour – Thought is unconscious, unspoken. When we ask them about their thoughts in certain situations. What they normally say is “I have no idea. I haven’t even thought about it.” A Coach can help here to reveal the unspoken beliefs and help construct a system ready for success. NLP teaches us what questions to ask in what way so that it helps people to reveal these hidden systems of thoughts. We can watch someone and get an idea of what they are thinking about, and how they are thinking but we can only be sure that we aren’t guessing by asking them. What am I talking about specifically when I talk about thoughts? When we consider thoughts we might just think, “I can’t control my thoughts.” “I get the thoughts that I am given.” That doesn’t have to be the case. We may think “If I do this or achieve this then I’ll think differently.” It doesn’t necessarily work like this. Thoughts precede action and they accompany action. The thoughts that precede action very often determine the action. Thoughts come to us in strings, groups, pockets of thoughts often one after the other. Repetitive thoughts. 90,000 per day and over 90% of them are the same ones that we had yesterday. We have a choice over our thoughts. We condition our thought patterns by repeating them. We frame our thought patterns through values and belief systems that sit deeply unconscious within us. These are based upon past decisions that we made about what is important to us and what is true for us. If you play sport or keep fit then something keeps motivating you to do that. What is it? When you think of the answer you will get statements like “such and such is important to me.”- a value or “I believe or think that if I do…then I will get…. (happiness, better life).” Decisions that you made in the past and that influence you now. If you don’t keep fit or you don’t play sport then what is it that is stopping you? Values, beliefs, past decisions. You can change your decisions, change your values and beliefs and therefore create a different motivation towards what you want. You can only do that if you know what they are. You can adopt other peoples thinking, values and beliefs by finding out what they are and deciding to have them for yourself. How do you get them installed? Use NLP techniques including repetition, visualisation. Experts in all fields have specific systems that they use in their thoughts and actions that they repeat consistently and that is what delivers their excellence. These internal systems, these thoughts are their Values, Beliefs systems. Strategies and States of mind. What are Values? – They are the things that are important to us. Things that we want and the things that we don’t want. We have values towards what we want and away from what we don’t want. Beliefs – consist of positive beliefs and also limiting beliefs about what is possible and about how things work. We have Strategies – for mindsets, decisions, and in ways of thinking that lead to a behavioural outcome. In terms of states of mind or “states” we can change states, chain states, collapse states, anchor in new strategies and states. These are all basic NLP techniques that we can use. In order to recreate excellence we need to discover and model these thinking strategies and systems of our modelling subject. Successful people have very clear objectives, outcomes and goals. If you really want to achieve something then you need to create desire, real desire and motivation to do it. You need to think “I just have to do this.” Or “I have to have this.” If you think like this then you can and you must. If you look at column 2 of your list and pick something out and say. “I’d quite like that to happen. I’d quite like to do that.” Then is that going to happen? Probably not. 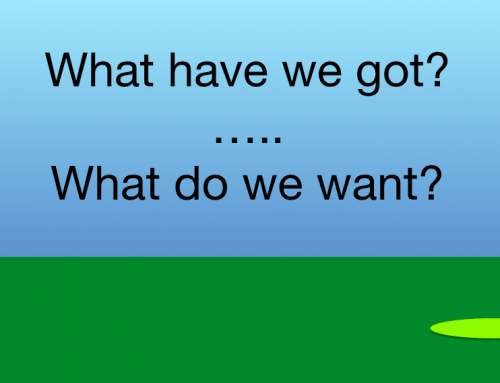 What do I mean by clear outcomes, objectives and goals? I mean a clear mental picture of what you want to happen. Successful athletes create this. Jessica Ennis the heptathlon gold medalist from the London Olympics is one who describes in her book how she used to visualise standing on the podium and getting her gold medal, really being there. How powerful a motivator is that! How would she prepare for her her events? Mental rehearsal. Seeing how she would perform, the smooth actions, the speed, feeling what she would feel, nice and calm, hearing the roar of the crowd. This stuff is really powerful. Listen to TV talent show winners they talk about dreaming of being on stage, they visualise being there. Pick one of your objectives from column 2 now. When you think of this thing then do you have a mental picture of it? Close your eyes now if you need to. Is the picture clear to you? Does it have you in your picture achieving your outcome? The key to using mental imagery is to Make the pictures more powerful, vivid, motivational, real life. We do this using a process in NLP called Submodalities. Indulge me for a moment, bring your objective to mind now. Have you done that? Do you have it in mind? Great. Make sure that you see yourself in the picture, achieving your goal. Notice what else there is in the picture? Is there anyone else there? Make it really colourful, notice the colours and really turn them up in your mind. Make the picture full size, right in the middle of your minds eye. What can you hear as you achieve your goal? Is anyone saying anything to you? Or about you to others? What else can you hear? How do you feel inside? What are you touching? What are you saying to yourself? How does that make you feel now? How do you feel about your objective? This is really powerful, isn’t it? Thanks you can open your eyes now. Thinking of this objective. We need you to be fully behind your motivation to achieve it. We need to be 100% sure that it is what you want. There are a number of mental checks that we can take to help you be sure. Ask yourself “What is it going to take me to get there? What am I going to have to sacrifice.” Ask yourself, “Is this ok? What impact will it have on others.” Is this ok? So, in our modelling project we are going to find an expert with the skill that we want and we are going to ask them questions so that we can understand how they are thinking before and as they carry out the skill that we want. We are going to find out how they hold their objectives in mind. We are going to discover their values, beliefs, strategies and states of mind. We are also going to discover how they move from big picture thinking to small picture thinking, the detail. We are going to do this using processes from NLP called hierarchy of ideas and chunking. The key to this is to listen to the words that people use and the way that they describe what they are thinking about. How they automatically and unconsciously use their Ability to cycle up and cycle down different levels in their thinking. Big picture might be focussing on the outcome, the overall objective, the mental thoughts and pictures associated with that. There will also be thoughts and actions associated with the detail as well. Successful people and experts often think big picture. When you ask them how they do something they will give you a big picture response. “I just do this or that.” In order to replicate what they do we need the detail. How have they build up the skill? What individual actions and skills do they have that leads to the outcome, to the process? Most skills have many little processes and other skills underneath them. These are skills built up over a period of time. We need to discover what they are and how they acquired them. What is an example of the detail? In a physical skill it may be a movement of part of the body. Ask yourself, “does my arm need to bend in a certain way?” Think “How do I achieve that?” Find someone who has done it. What did they do To get to that movement or flexibility? We chunk together actions and thoughts as we build a skill. They become unconscious to us as separate items. We do them automatically and we must discover them one by one, practice and refine them to get the overall outcome or process. What I am talking about here is developing a plan for deliberate practice. Anders Erickson has done lots of research on building skills and talent – he says we need 10,000 hours of deliberate practice to create world class. Not just any old practice. Any old practice means practicing your mistakes. He talks about deliberate practice. The detail. We look at people doing things and we think, “I’ll never be able to do that. They must have been born with that talent.” This is a Limiting belief. It doesn’t necessarily have to be true. There has been lots of research and books written on this subject. Talent is overrated, Bounce, are just two. See your modelling subject carrying out the skill. Maybe their body does do something that yours doesn’t do. However there are ways of conditioning thoughts and body to get them to do things that they don’t do now. Eg Bill Bailey – basketball. Expanded awareness. Provokes neuron response. This is something that we teach on our courses. It may be that your objective is to be nice to people. What does it take to be nice to people? Find someone who does it the way that you would like to do it. How do they do it? Mindsets, habits, actions. Start with the big picture. Work down to get really specific about what you have to do and how you have to think. It may be that you are a top sportsperson or want to be. How do you develop and refine your skill and expertise? Start with the big picture, beliefs, attitudes etc. and then get specific. Every moment has a thought pattern, thinking systems that are vital to success. In his book Bounce, Matthew Syed talks about key moments in sport where people choke, crunch moments, for example penalty shootouts – we are talking brain freeze time. We need to rehearse these moments in full colour! Think: What will you do? what will you hear and see? How must you feel? What must you focus on? What sequence of thoughts do you want? Preparation. Rehearsal in minute detail. Over and over again. We programme our behaviour and thoughts so that they are automatic. They give us what we want in normal circumstances. What happens in a unique environment, these crunch moments? We don’t have programmes for that. We become a beginner again. We choke, we lose. We think “Next time I will know what to do.” Why wait until next time? It might never come again. We might say to ourselves. “I’ve reached my limit.” If we say that then we have. Limiting belief. 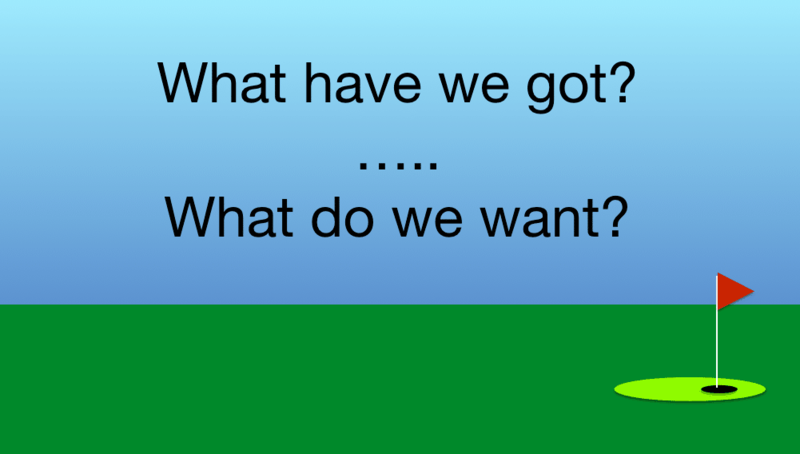 What are the values, beliefs and strategies that we need for these moments? Ask someone. Use NLP. Get your action list for deliberate practice by cycling up and down from big picture to small picture and back again. Students from our NLP courses have used this modelling skill in all sorts of Different modelling projects. Becoming an expert in Chalk drawings, learning English, Networking, Golf, Financial Trading, Sales, Presentations, Martial Arts. They can be large projects or small. The techniques are the same. One guy decided that he wanted to be able to stand on one leg and crouch down without falling over. He modelled someones strategy, physical and mental to do that and he learned to do it. He was already a strong guy so it didn’t take long once he knew what to do. Having a process to follow, knowing how and what is the key. I hope that you have found this useful and motivating? Hopefully we have started something here for you. You have your list of goals and objectives. Just look back at that list again now. What is the one thing that you really feel like you have to do or have? Take that thing, make a commitment to yourself now to go and get it. Make this your own personal modelling project. Start it today. Learning NLP is just the beginning of the journey. It provides you with a set of tools that you can use in your life to make it fulfilling, so that you get what you want, so that you can improve life in the now and look back on it in time to come happy that you made the most of it. Thanks for your time. I’ll see you in the next video.